Genevieve DeJongh Huizenga's eyes glimmered with nostalgia as she walked among antique desks at Old New Groningen Schoolhouse. "I'm just so happy people cared enough to have this restored," she said, sitting at a desk with a brass plaque bearing her name. A former student at the school, she recalled many happy days and one very caring teacher. 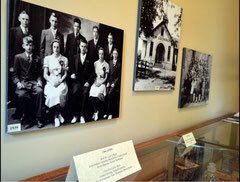 Her visit took place during Wednesday's 40th birthday bash for the Zeeland Historical Society. Outside, people were eating ice cream, listening to acoustic music and playing games like jacks and rolling hula hoops. At one point, everyone gathered for the unveiling of two large signs acknowledging donors who helped pay for most of the schoolhouse's $350,000 renovation costs. The society still needs to raise $25,000. Society member Kit Karsten said "four Bs" are critical to schoolhouse history: bell, bricks, basement and bats. The school's original bell was bought back, the Veneklasen bricks were restored, the flooded basement was dried out and the bats were chased out of the building. The 10-year odyssey included the near-death of one contractor, Neil Ruffner, Karsten said. Ruffner was in the crowd Wednesday with his family, ranging from his mom to his five-month-old grandson, Kiptyn Lehnert. Old New Groningen Schoolhouse is one of two buildings obtained and preserved by Zeeland Historical Society during the past 40 years. Dekker-Huis Museum on Main Avenue is the other. Society members are hoping to erase the last $25,000 of debt on the schoolhouse's $350,000 renovation. 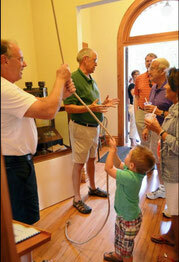 Neil Ruffner, left, shows his grandson, Jaxtyn Lehnert, 3, how to ring Old New Groningen Schoolhouse's bell while Zeeland Historical Society member Kit Karsten, center back, talks to donor Jack DeWitt during the society's 40th anniversary celebration on Wednesday. Five of the society's founding members gathered for a photo. Charter members Dorothy Voss and Wilma Veldheer, the society's first president and curator, respectively, were thrilled by the crowd's age range, from Kiptyn to people in their 90s. Volunteer Sara Donkersloot, who helped organize the evening and emceed the evening's program, "is about the same age as Dorothy and I when we started the society," Veldheer noted. Another charter member, Mary Jane Vander Wiede, said she "wore many many hats" in the society's early days, juggling her volunteer time with a full-time job at Sligh furniture and raising her two children. Preserving Zeeland's history is important she said, "because we have stories that many, many people know, but they have never been written down." Evan Berghorst, 10, helped dish up ice cream before joining in on the games. Later he turned to his dad, Chuck Berghorst, pronouncing the party "the best night of the summer." 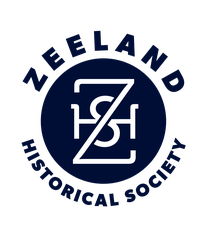 Voss told the crowd the challenge is to keep the Zeeland Historical Society's work going by getting at least the next two generations involved now. "We are rich in buildings, but not rich in finances," she said. "We need a sure base of sustainability. And that will be the goal of those who follow us." Wednesday's ice cream social is just one event planned to mark Zeeland Historical Society's 40th anniversary. Volunteers are planning a fall event, with details being finalized in the weeks ahead.